Review – © 2018 St Michaels Village. St Michaels Village Hall is a registered charity. Charity No. 1023457. ‘It Is Now’, Shindig play by Anonymous is a woman company. We welcomed the company “Anonymous is a woman” on Thursday 28th march to set up, rig lightening and press costumes, create a wedding reception setting and tuck into a St. Michaels tea before performing a thoroughly enjoyable and professional programme of “It is now”. The wedding reception is held on 30th July 1966 which is etched on our memories of that world cup so very much. Alas for the wedding party this helps to cause chaos but the audience all 56 of us were totally mesmerised and taken aback to the 60,s with the music and involvement as wedding guests and interactive characters. The play was delivered by 4 excellent actors and actresses, delightful in their own right and exceptionally clever at their craft. For those of us who can remember, a number of issues around the 60’s were mentioned and subtly slipped in it certainly took us back and made us think and most of all LAUGH. LIVE and Local — sponsored by local councils and Arts councils. I don’t know how much people are aware, but Live and Local (shindig) company are exactly as they say -LIVE- theatre,music,puppetry, dance, groups, individuals and -LOCAL— to our county, being Worcestershire. They provide theatre for counties in the midlands. At the beginning of the season we are invited to have a taster of the years programme in one of the village halls in Worcestershire., returning with the responsible job of choosing a topic that we hope will go down well with everyone.Then after form filling and phone calls we bid for a 1st,2nd and 3rd choice hopefully getting a successful choice which will be popular and draw an audience in. After dates, times are sorted with the individual company we start promoting with posters everywhere, selling tickets, then arrange arrival which is usually 3 to 5 hours before the performance, help sort the staging, lighting and props, look after the cast and their needs, feed and water them and wait for you all to experience a good theatre in the sticks! After which the clearing away and finalising paper work concludes.These excellent groups of people work so hard- they are the masters of their craft and an honour for us to experience as you have done. Thank you. “It is now” captured our attention in our own surroundings, “Reynard the Fox” (a first experiment of family performance theatre) will be received well we hope. Unfortunately we don’t make a lot of money on these performances as we agree a figure before the shows and very little profit is made. But they are delightful to welcome and so good to offer a variety to our events calendar in the village hall. 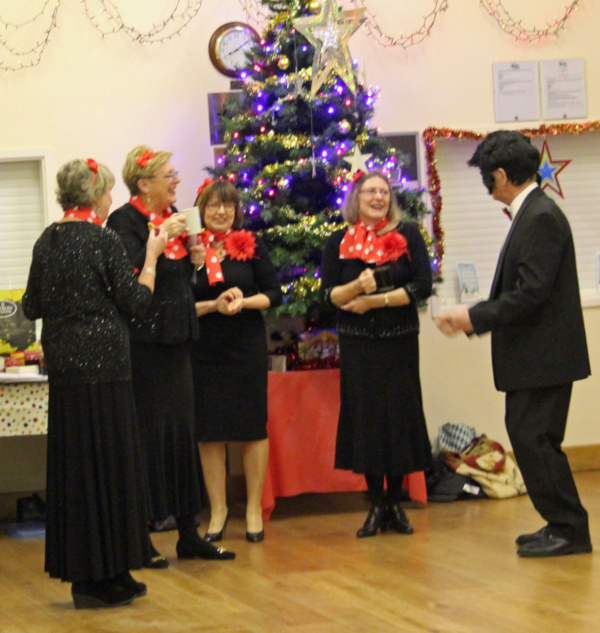 If there was ever any question that Christmas 2018 was just around the corner, then the St Michaels Singers, who entertained us with their Christmas Crackers concert, left no doubt in anyone’s mind and certainly made sure that by the time we left, we were all well and truly in the festive mood. The concert was performed on 20 and 21 December, and was well attended on both evenings. 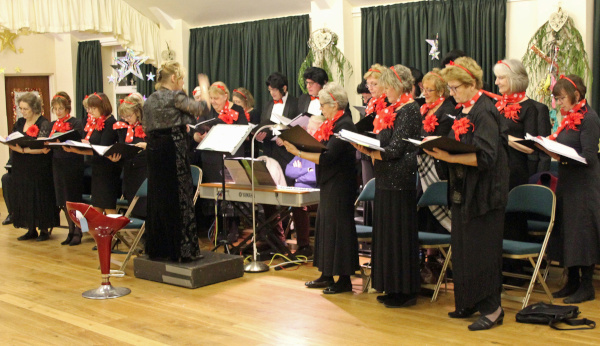 It was held in The Village Hall, adorned with Christmas decorations, and in the interval we were served hot mince pies while the raffle was drawn. The choir, directed by Jacqui Cable and accompanied by their wonderful pianist, Kath Ainsworth, performed a most entertaining programme of seasonal songs, carols and readings, and managed to convey the true spirit of Christmas with selections from the traditional and festive to the light-hearted and comical. Their opening chorus of ‘Angels Sing Glory’ showed just how versatile, talented and hard working they are to achieve such a rousing opener and their ‘Variations on Fa La La’ took us from the well- known chorus into a surprising journey culminating in the ‘1812’ with accompanying cymbals and explosions! On the way there were many highlights including the beautiful ‘He is Born’ and a delightful duet with Geoff and Jacqui singing ‘Christmastime’ and… yes, who can fail to mention Peter and his rendition of Goodness Gracious! The sketch of an alternative ‘Cinderella’ story was very entertaining and well narrated by Ros, ably assisted by Chris , Mike , Muriel, Geoff and Lesley. A special mention must go to the MC, Mike Jordan who, as well as introducing the proceedings, entertained the audience with a selection of Christmas cracker jokes which made us laugh and groan in equal measure! There was plenty of opportunity for audience participation starting with Hark the Herald Angels Sing’ and ‘Silent Night’ and in the second half very one joined in ‘Must be Santa’ with lots of enthusiasm. By the second attempt at ‘Christmas is Coming’ we started to sound quite tuneful, though I’m not sure Jacqui would agree! 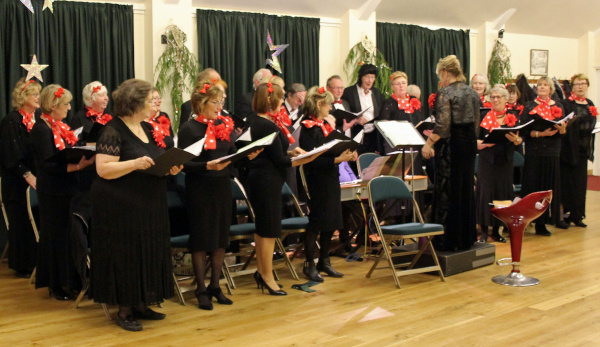 They were thoroughly enjoyable evenings, and we all say a big Thank You to the St Michaels Singers. Also a big thank you to Muriel who raised £198 on the raffle. A great evening of skittles, team events and individual. A great deal of enjoyment was had by a very big turn out, lots of cheering and shouting went on. Competition was high and a great mix of ages who enjoyed the atmosphere of the evening. A big thank you to Vernon Albert and his friends who organised the evening- it certainly was a huge success. Thanks to the kitchen girls for preparing delicious ploughman’s suppers. We had a birthday boy—it was a pleasure to sing happy birthday to Jim Franklin and see him blow his candle out. A very big Thank you to you all for coming and helping to put away chairs and tables at the end! We started the year off with a hilarious, energetic fun game evening of several rounds of beetle drive. A lot of people came out on a cold winters evening and went home happy and warmed up by good fun from such a simple old fashioned game. A great mixture of young and older attended, no cheating occurred or at least very little? Thankyou to all for joining us, thankyou to Mike and Mary for running the evening. A good start to our social programme and all tucked up in bed by 9.30pm! Quite an amazing old fashioned fun filled party was held again in the village hall- filled with a delightful group of people both local and visitors. The tables had been set with candlelight and festive cheer, a wonderful bring and share meal prepared and displayed and a simple no fuss atmosphere as soon as you walked in! And we did, having just landed at Bristol airport from Madeira, so what a wonderful greeting and welcomed great team had put together, Thank you to all who worked so hard to prepare such an evening. As well as a lovely feast there was a great picture quiz and multiple choice quiz to work on, the shed men sang and played to us and Stuart set to with some hilarious games involving blow up instruments and dancers which I’m not prepared to describe! Fizz at midnight and good wishes bought such a night to a successful and happy end. Following the Birmingham University singers concert of lessons and carols on the 15th December, many people found themselves in the village hall enjoying a lovely Christmas meal. There was an immediate warm frenzy as people came in, ready to relax a little after the activities of village life in December! A lovely meal was served, this year by our young Brazilian couple, Louis and Emmanuelle, the committee looking after us with a good bar, novelties, a quiz to sing for and some rather naughty jokes! It was as usual a very pleasant interlude in the hub of Christmas activities. This weekend made us all realise and appreciate the hard work, planning and thought which has been long in the making of a year only to bring the commemoration of 100years to such a sincere and poignant time. All over our land whether young or old we came together to REMEMBER our forefathers, those who in every family gave lives so that we could be here today! In St. Michaels and All Angles we have created an exhibition of many displays relating to events and circumstances of the climax of the war in 1918 both at home and in the battlefields. The exhibition has been extended until 23rd November to visit or revisit. We have enjoyed a poetry workshop which inspired some wonderful poetry and will follow on the 15 November with a poetry evening at 6:30pm for an hour of music and poetry. The WW1 concerts on 9th and 10th November were most stirring, they touched the hears of all those involved as well as the audiences. We were delighted to have welcomed the pupils of Tenbury Ormiston High School to bring their moving production of War Horse along as well as a most professional team of technical lads providing light and sound which created the atmosphere it deserved. Along with the nation, we held a very special armistice service standing in the bright sunlight, remembering so many, and followed with a PEACE lunch in the village hall. There needs to be more written about this Remembrance 2018 but for now we hold on to the poppies and the doves to take us into the 21st century, to a future of HOPE and PEACE whether we are in our very small rural corner, town or city, on this island or anywhere in the world! A very big thank you to all who put so much effort and time into a very splendid memory. We hope you agree-“variety” was the word for this event. So varied were the acts that the atmosphere was alive with smiles and laughter with a warm glow from both artistes and audience! We were fortunate to have Brian and Alison to start us off with a selection of four songs, beautifully sung by Alison accompanied by excellent guitar playing from Brian who also provided some excellent PA sound equipment which backed the other acts also. Next PJ Walker sang Johnny Cash songs entertained us with some good favorites and again wonderful guitar playing. The land girls gave us a rendition of first world war songs to commemorate the end of the first world war, accompanied by Kath Ainsworth. A refreshing act in Rod Vincent, a poet in his own right entertaining and gifted in every way! After the break we welcomed Shannon back again, who sang three songs with her beautiful and professional singing voice. John Mosedale sang his own compositions, I’m sure you will agree they were very competent and so amusing. Emiko Zhang played us some beautiful music on the piano (without manuscript) she was excellent. Emiko is from China and attends St. Michaels College. Jacqui Cable gave us a warm rendition of two beautiful songs! They were beautifully song accompanied again by Kath Ainsworth. And finally thank you to Alan Hooper who very cleverly and calmly told us some very funny stories. We were entertained superbly by such a grand group of entertainers and thank them all enormously for their time and efforts. We hope you enjoyed the evening. A big thank you to Stuart and Eddie in preparing the room and staging and to Stuart for organising the event. whether it be good or bad! And we did until it cam down in gentle stair rods!! It was a different idea to hold the fete in the autumn and perhaps not a bad idea as we can all remember about 3 years ago when the wind and train travelled through the stalls taking them down one after another – and that was in June! However we are of course most appreciative of Jane and Jonathan for their kindness in hosting the Autumn Fete and such a lovely touch in providing colourful apples for all the help themselves to and damsons to start the pies and gin off with! Thank you to all the stall holders for their hard work in preparing their stalls and wares, collecting goods and produce and working hard afterwards clearing up. We ere very appreciative of Tenbury Town Band, they provided such a lovely atmosphere playing some wonderful familiar tunes. The Scottish dancers for an excellent performance just before the rain. We know they put in extra time to rehearse for the day. We welcomed the Hereford and Worcester Animal Rescue who ran the dog show, there were some very well behaved and much loved dogs arriving down the drive and we believe most went home with a ‘rosette’ to cherish. We were grateful for all who cam for the fete and hope most were able to stay for the spectacular performance of Miss St Michaels – what a team and such hidden beauty – can’t think where they have all been hiding! Most thanks go to all who helped arrange and organise the fete, produce posters, moved chairs and tables, crockery, man stalls, put up and down gazebos, marquees, signs and bunting and generally spent a lot of time, effort and energy. Well done. The fete made a profit of approx. £900 which helps the hall to run. Thank you all. On Monday 24th September we had a most up to date delivery of a first aid course in the village hall provided by Dee Little from Cheshire. 13 villagers attended and had opportunities to review yet again CPR practices on adult, infant and child dummies together with updating the expected practices on infection, falls, burns, cuts and day to day first aid. Thank you to all who supported and took part, we all need regular reminders of first aid practices we can manage and hope we can repeat this in the near future.